Ground Motive: The Quest for Salvation and Our Social Engagement: Are They Reconcilable? The Centre for Philosophy, Religion, and Social Ethics, the Centre for Community Based Research, and the Christian Reformed Church of Canada, are currently partnering in an exciting research project entitled, “Justice and Faith: Individual Spirituality and Social Responsibility in the Christian Reformed Church of Canada.” Conceived as an attempt to identify the most significant trends in this community’s understanding of justice, faith, and the relationship between the two, the Justice and Faith project will process information from diverse sources (from scholarly articles to surveying the people in the pews), hoping to provide insights to the questions at hand. One of the sources under construction is a literature review, a collective document where researchers compile findings from recent scholarship, trace emerging themes, and highlight points of dialogue between different authors. Through the review of academic and popular sources, the research team has already shed light on issues that are defining trends. This is the first of three articles written by three graduate research assistants working on the project, which contains some preliminary reflections on the literature reviewed to date. 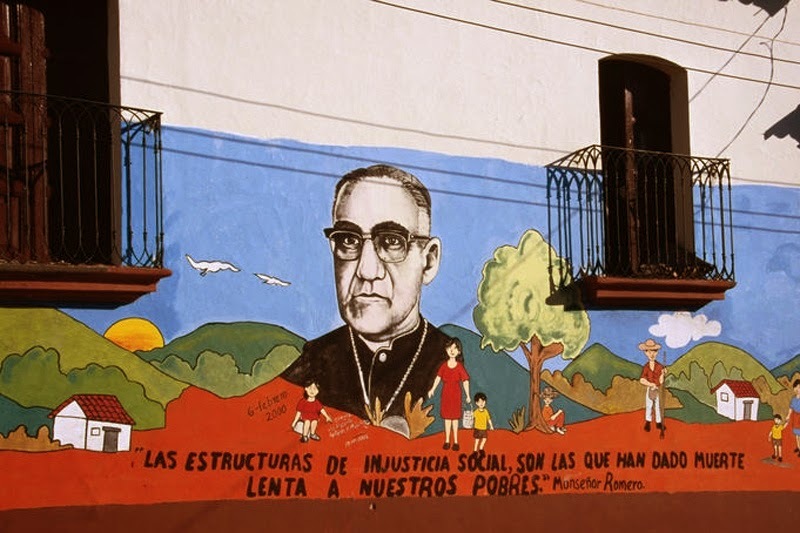 This week, the Christian world remembers the life and work of the Salvadoran priest, theologian, and activist, Oscar Romero. It was 34 years ago when, in the middle of a church service, Romero was brutally assassinated by members of the Salvadoran “represión.” In the months prior to his death, Romero took advantage of every possible opportunity, on and off the pulpit, to speak out against the deteriorating socio-political situation of his country, inviting Salvadoran soldiers, as Christians, to obey God’s call for justice and to stop the oppression openly enforced by their government and military. Romero’s life was not always that of an activist and an adept pastoral leader. In fact, years of research in ascetic theology, a field of studies dedicated to explore the way to individual perfection through self-discipline, isolated him to the point that he remained a stranger to his own country’s cry for justice up until his appointment as a bishop. This radical shift obeyed both personal and professional reasons, and marked two definite stages in Romero’s work. Throughout the first months of research in the Justice and Faith project, we have encountered the fact that the bifurcation expressed through Romero’s life--and the lives of many other leaders-represents the interaction of two basic “moods” within contemporary Christianity, as church members attempt to engage the world critically, responsibly, and faithfully. Current Christian activism has become one of the most prolific contexts for reflection on these “moods,” which are perceived as varied interpretations of the link between faith practice and social justice: while, for some, the path of eternal salvation is a hermetically sealed transaction between God and the individual, for others, the construction of God’s Kingdom is inexorably linked to the effects of our collective historical agency. As in many other cases, these tendencies are only the extremes of the plural spectrum that constitutes North American Christianity. Pastoral practitioners and political activists have explored the causes behind these “moods” through the analysis of the faith components inherent to political and social engagement and the way in which the Christian Scriptures are grounded in particular understandings of justice. Practicing activists and those who reflect on the reality of activism have engaged in active dialogue on the matter, often including references to the construction of God’s Kingdom and the role of hope in the opening of historical possibilities. Their goal is for other areas of Christian scholarship to become energized by this impulse, incorporating this exploration in the development of models oriented toward a greater understanding of the relationship between justice and faith. The Justice and Faith research project aims to be one of the groups working on this front. At the grassroots level, activism that fosters integration between faith and justice from the perspective of the Christian tradition has been developed on two different fronts. While some groups of Christian activists start their engagement on the basis of their own reflections on the Christian call for action, others conclude, after their social engagement with the world has taken place, that it is not possible to sustain their activities unless they ground their work on a sustained faith formation. Either way, such social and political praxis seems to advocate for an integration of faith and justice, which interprets human agency as the action of God for a world in great need. Those activists that come to a life of faith from social action, arriving at the notion of justice from their political/social experiences, encounter a different type of difficulty. Faith congregations do not necessarily agree on the integration of justice and faith, expressing their position in their apathy to interact, as communities, with other structures of life in society. The literature states that this apathy is rooted, for the most part, in the community’s understanding of three elements: God’s action in creation, the plausibility of collaboration between God and humanity, and the practical effects of human agency in the world. While some Christian groups are willing to describe their faith as rooted or connected to justice, there are a number of groups for which salvation, as the guiding principle of any Christian’s faith life is radically different from our action in the world. In The World Is Not Ours to Save, the pastor and activist Tyler Wigg-Stevenson describes this tension when he focuses his analysis on the possibility of human input into the salvation of the world. Wigg-Stevenson frames the two sides of this confrontation, which encourage bifurcation or integration, in his own experience as an activist, finding that the actual practice of the young activist reveals the validity of both approaches. While it is pivotal to understand one’s action in the world as transformational and critically necessary for salvation, says Wigg-Stevenson, it is also important to see how the salvation of the world is not in anybody’s hands but in God’s hands alone. For Wigg-Stevenson, the Christian life, represented in that of the activist, expresses the tension between these premises, and concludes that the salvation of the world is not in our hands. Although this explains many of the frustrations and problems faced by activists in their work, it should not be a call to renounce such a work but to reframe it so that those involved are better able to understand that the transformation they are effecting is not equivalent to salvation. Even though this position seems to incorporate some of the most important aspects of the two Christian “moods,” it does not accomplish a full integration, particularly in terms of the link between our drive for social justice and God’s overall plan, as it unfolds in history: whereas our agency in the world appears to carry significant meaning, it does not have any salvific effects. Is this position moving us closer to an integrative perspective? Does this analysis represent a gain for social/political activists? If not, which discourse would illuminate the projects of social activists in a more direct way? These, amongst many others, are the questions to explore as we delve into current literature on the way Christians engage today’s society.